Sheffield's Cultural Industries Quarter is enjoying a renaissance, thinks Tim Bottrill. "There's a lot of stuff happening in and around this area," says the board member of the Sheffield Property Association who runs his own agency, Colloco. "Over the last two to three years things have really jumped on." He is surveying the Alsop Fields complex's first phase alongside Sean Elwood of the scheme's developer Elmsdale Estates, part of City Estates - the company behind the West One apartments near Devonshire Green, the Gatecrasher flats and Sellers Wheel on Arundel Street, home to Tamper Coffee. The project, worth more than £10 million, comprises four buildings bordered by Sidney Street and Matilda Street - Albert Works, Speedwell Works, No 77 and a new build replacing the former Niche nightclub. Marketing specialist Jaywing has moved into offices at the old Albert Works forge that have won acclaim for their sleek design, while Birdhouse Tea Company has a popular café that opens onto a courtyard at Speedwell, where postgraduate experts Find A University and Redbrik estate agents have also taken up space. Further companies are poised to arrive around the site and tenants have settled in to apartments at Niche that are pitched at professionals, not just students. "Fingers crossed we're hopefully on the cusp of getting it all away," says Tim, who is in charge of letting the commercial units. And there is more to come. Phase two of Alsop Fields - weighted towards business space and expected to be ready in two years' time - will be built on the opposite side of Sidney Street, reusing vacant land and other heritage buildings. A third stage is to follow. 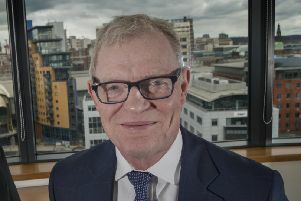 The Star is focusing on the mission of the SPA – which aims to be the ‘collective voice of property in Sheffield’ – through a series of features looking at major schemes. In each case, members – a diverse group including developers, both city universities, planning consultants, solicitors and agents – are contributing in a professional capacity. The CIQ got its name in 1981, and refers to a triangular-shaped zone roughly between the city centre and the railway station, defined by traces of Sheffield's past of self-employed 'little mesters' in metal trade workshops. The idea was to bring about regeneration through arts and creativity - hence the presence of The Leadmill, Yorkshire Artspace, Site Gallery and the Showroom cinema with its adjoining Workstation. Alsop Fields is an 18th century term - it once referred to the area around Sidney Street but has been revived for Elmsdale's mixed-use venture, designed to be a destination in itself. "We've kept as much of the old buildings as we could," says Sean. "That's a key selling point, the old character." Tim agrees. "If you can bring buildings back to life they work - whether they are residential, commercial, bars or restaurants." He draws parallels with the resurgent Kelham Island, now a thriving hub of modern homes and fashionable cafés, as well as the plans for high-end food halls at Rutland Cutlery in Neepsend and at Leah's Yard in the city centre. "Success breeds success. Schemes like this, when they let well - which this one has - underpin the market. It proves Sheffield is a viable economic place to invest and develop property." Jaywing's offices - a stripped-back environment that contrasts exposed brick and concrete flooring with attractive wooden desks and leather Chesterfield sofas - are particularly impressive, Tim and Sean think. "Sheffield is not a major corporate office location," says Tim. "It has a lot of owner-managed businesses - people who are very aware of staff wellness and happiness, which are very much buzzwords at the moment but I think quite a lot of people do believe in them. And put their money where their mouth is and look after their staff. Part of that is making going to work slightly more enjoyable." Sean concurs. "One hundred percent with Jaywing and Find A University. They've got massive office space which they've sacrificed for a games room or a staff canteen. No-one's content with instant coffee. It's changed." Elmsdale worked with tenants on the fit-out, allowing occupiers to come up with interesting interior designs. "Being local developers they have the ability to sit down with tenants to structure a deal and the fit-out around what they want, rather than giving homogenous dry specifications," says Tim. And outside, there's another attraction - a pleasant walkway along the Porter Brook river, making a feature of the neglected waterway. A similar path is planned at a nearby scheme led by developer Platform_, which wants to build 335 apartments off Sylvester Street on a surface car park next to the Decathlon store. There is an ambition to link the paths up to create a proper route to stroll along. "You'd choose this over the street," says Sean.